Buffalo Bayou is a natural river, of course, with important biological and ecological functions, like cleansing the water. Created by nature some 18,000 years ago, the bayou has its source in the Katy Prairie west of Houston and flows through Barker Reservoir and the floodgates of Barker Dam, then for some six miles through Terry Hershey Park, a 500-acre linear forested park, and continues on for another sixteen river-miles into downtown Houston before ending up in Galveston Bay. Barker Reservoir and, just to the north, Addicks Reservoir are both dry reservoirs, located in Buffalo Bayou’s upper watershed. Built exclusively to control flooding downstream, both federal dams drain into Buffalo Bayou and hold storm water only temporarily to prevent the river from causing or adding to dangerously high flows downstream. The floodgates are always open except when it rains at least an inch downstream–or half an inch if the Corps is already in the process of releasing impounded storm water from the reservoir pools–explains the Corps’ Galveston District Water Control Manager Charles Scheffler. The bayou, a perennial river, meaning it flows all the time, has water in it even when the dam floodgates are closed. The bayou even floods when the floodgates are closed. This is because rain that falls in Terry Hershey Park and downstream of the dams runs off the ground (and through drainage pipes, etc.) into the bayou. (That’s unless it can soak into the ground or be absorbed by trees and plants, which helps recharge the groundwater and reduces flooding.) In addition, three ditches or sloughs that run around the outside perimeters of the dams carry rainwater from the south and north and empty a significant amount of stormwater into Buffalo Bayou even when the floodgates are closed. Radack is surely aware of the controversy over the impact of these free-flowing ditches on Buffalo Bayou, particularly the Clodine Ditch, which brings stormwater from Fort Bend County. Numerous tributaries and creeks, not to mention ditches, storm and wastewater drains downstream of the dams flow freely into the bayou. But the Clodine and Barker ditches and Turkey Creek empty into the bayou right below the dams. Clodine Ditch, which has its origin in the Longpoint Slough in Fort Bend County, drains an area of 10-15 square miles, runs along the east side of Barker Dam and flows into Buffalo Bayou at Highway 6 just below the dam floodgates. There it meets Barker Ditch, which drains runoff from Interstate 10 and runs along the northern outside edge of Barker Reservoir and then south into Buffalo Bayou. Turkey Creek receives water from as far north as Jersey Village, flows along the outside eastern edge of Addicks Reservoir and enters the bayou in Terry Hershey Park near N. Eldridge Parkway. Together the uncontrolled Clodine and Barker ditches can contribute as much as 1,500 cubic feet per second (cfs) of water to the bayou when it rains and the dam gates are closed, according to Michael Huffmaster, president of the Briar Forest Super Neighborhood and a homeowner on the south bank of the bayou in Terry Hershey Park. During major storms such as the April Tax Day storm last spring, when the dam floodgates were closed, the combined flow of Clodine and Barker ditches reached nearly 5,000 cfs at Highway 6, based on the USGS gauge on Buffalo Bayou at Highway 6. The flow downstream at Beltway 8 measured nearly 6,500 cfs that day, and by the time it reached Piney Point, the bayou was flowing at at over 7,000 cfs. People “start to get wet,” as the Corps’ Scheffler puts it, when the flow downstream goes above 4,150 cfs as measured by the USGS gauge at Piney Point, which is part of what the Corps uses to decide whether to open or close the floodgates. However, Richard Long, the Corps’ supervisory natural resources manager of the dams on Buffalo Bayou, cautions that the gauge at Highway 6 can reflect water that has backed up from rainfall or “other discharge points” downstream. 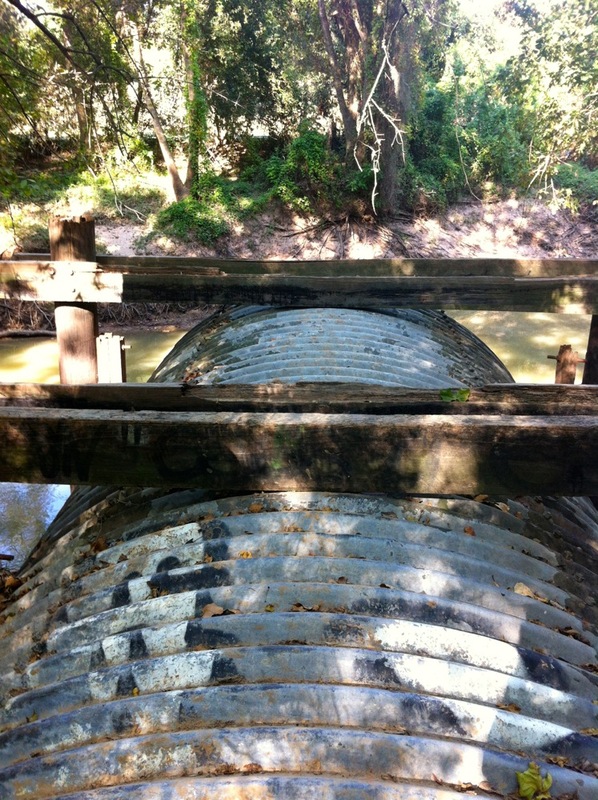 Other discharge points would include, for instance, this very big drainage pipe on the south bank of the bayou in Terry Hershey Park. Drainage aimed directly across the stream acts like a dam and causes blockage of the flow. Big drain pipe on south bank sends water directly across Buffalo Bayou in Terry Hershey Park, acting as dam during storms. Photo October 2015. There are also two City of Houston wastewater treatment plants discharging treated water into the bayou in Terry Hershey Park: Turkey Creek east of North Eldridge Parkway and West District west of Beltway 8. Residents in the Briar Forest area are opposed to Harris County Flood Control District plans, supported by Radack (see below), to remove forest and scrape out detention ponds for floodwater on the south bank of Buffalo Bayou in the park. The unpopular detention plan, known as Charting Buffalo, would carve out some two dozen detention basins overall on both sides of the bayou in the park but create only about 280 acre-feet of detention at a cost of millions of dollars. Trees are important natural storm water detention devices, and it makes little sense to remove them to create detention ponds. Destroying forests is a violation of the flood control district’s legal obligation to conserve forests. The Briar Forest group was successful last year in persuading the City of Houston not to build up to six large detention basins at a cost of $3.5 to $8.5 million on the south bank in the park. 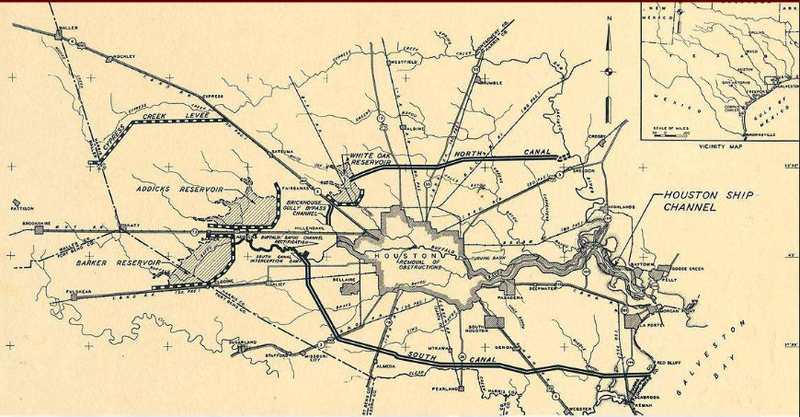 But the flood control district’s plan, though apparently dormant, is still alive. The Briar Forest group proposes, instead of the destructive in-channel detention basins, that Harris County work with Fort Bend County to build a regional detention basin in the Clodine area that would temporarily hold 700-1000 acre-feet of storm water, reducing the peak flow in Buffalo Bayou under Highway 6 by half, according to Huffmaster. It’s true that the flow in Buffalo Bayou is very low when it’s not raining. Called the base flow, at this time of year the median base flow is about 150 cubic feet per second, which is very leisurely. It’s been reported that much of the base flow in the bayou, normally the result of groundwater seeping into the river, is recycled wastewater, which is the case for many urban rivers, including White Oak and Brays bayous, now surrounded by so much impervious surface in the form of buildings and pavement that the rain cannot soak into the ground, or in the case of White Oak and Brays, seep into the concrete channel. Note that there was a time in the 1940s when the Corps was releasing up to 7,900 cfs into the bayou following rains. (The dams were designed to allow a combined discharge of 15,700 cfs, but that was back when they had plans for a south canal, among other things.) But having made the bayou downstream safe for development, development on the bayou downstream forced the Corps to reduce the flow in the 1960s to 2,000 cfs to avoid flooding lawns and flower gardens, etc. (“People were getting wet,” says Scheffler, who’s been with the Corps for forty-one years.) This year development upstream and heavier, more intense rainfall pushed the Corps to double the maximum allowed discharge from the dams to 4,000 cfs. With a record amount of water impounded by the dams last spring, the Corps was forced to release as much water as quickly as possible in order to be prepared for future storms. 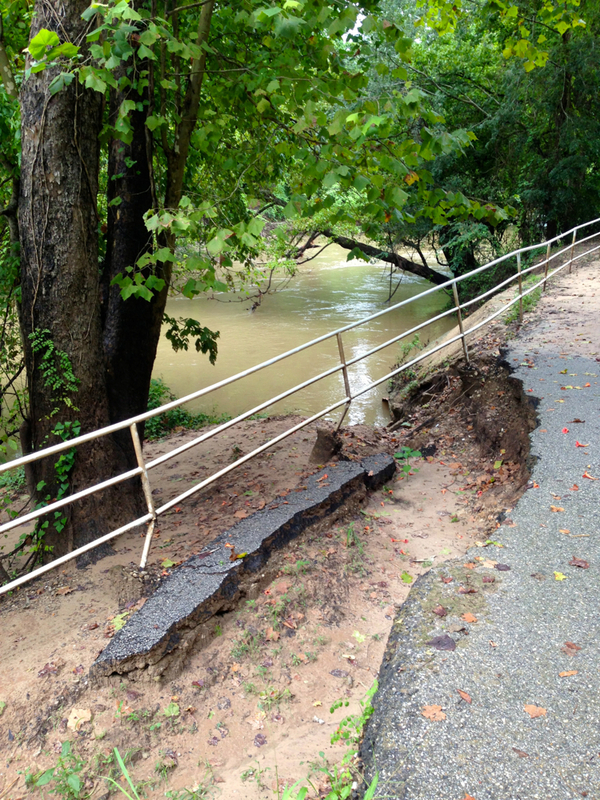 With continuing rains, draining the reservoirs took months, and caused erosion problems up and down the river. “It’s not a natural flow at all,” said Radack, unswayed by the observation that the bayou was a living river, with trees and plants and fish, behaving as rivers do, naturally adjusting to the high flows that it probably once had. “It’s a man-made occurrence,” he insisted, referring to the disturbed banks and broken path. So Radack is going to forge ahead with the most expensive solution, even if it damages the natural beauty of the park of which he is so proud. “I believe that what we’ve done is an enhancement to Buffalo Bayou,” he said, referring to the creation of Terry Hershey Park in 1993. 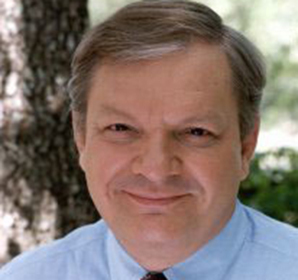 Radack has been commissioner of Precinct Three since 1989. “Maybe there will be one or two, a few places” where he would consider moving the path away from the bank. But “right now we’re putting it back together the way it was,” said Radack. “We’re going to continue and I would say there will be detention on the bayou too,” referring to the flood control district’s controversial and seemingly contradictory plans to remove trees and excavate detention basins along the bayou in the park while simultaneously “repairing” the banks where the bayou was naturally doing practically the same thing. 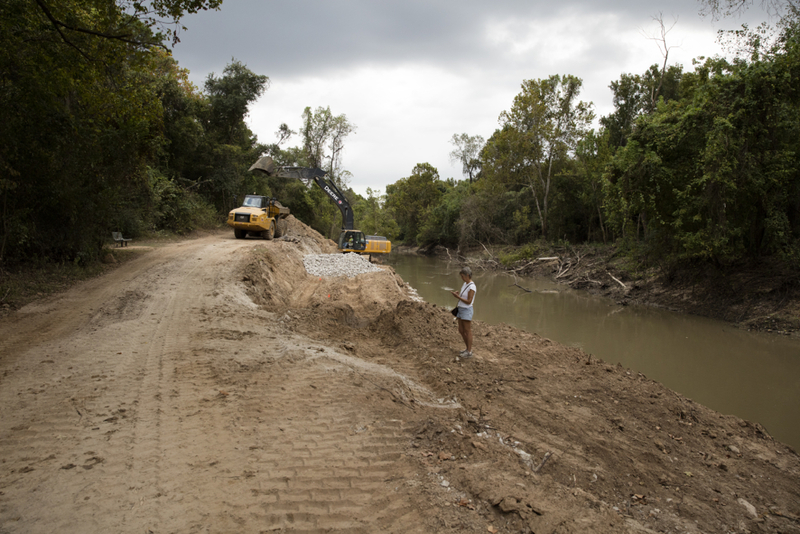 “Any detention in the Buffalo Bayou channel is symbolic,” says Briar Forest’s Huffmaster, referring to the costly creation of artificial detention areas by digging up the forested banks. “Approximately 1000 to 3000 acre-feet are needed to address structural flooding, and Charting Buffalo identified only 280 acre-feet from detention along the bayou channel. For more information on the most advanced ideas in river management and working with nature to reduce the hazards of flooding, we recommend the book Floodplain Management, A New Approach for a New Era. You don’t want me to sign another petition? You’re just trying to educate me on the sad situation? Thanks, but I think that if you want change, or want change stopped, you’d better get hold of one or more sensationalists – people who know how to shine dramatic light on situations needing it. Yes, we are trying to educate the public as well as our civic and political leaders. And we are shining light on situations needing it. So far, so good. Your part now is to contact your city council member and county and federal representatives. They are all on or mailing list, but it would help if you would let them know what you think. Start a petition! Wow, I’ve always thought that Steve Radack was one our sharpest commissioners and he’s always been one of the few Republicans I’d always vote for…until now. When I have a drainage problem at my home, I put on boots, grab an umbrella, and go out in a pouring rain to see where the water wants to go. I think Buffalo Bayou, the NATURAL river upon which Houston was built, has just clearly told us where her water wants to go. We’d better listen because she’s already proved that she’s pretty powerful! Radack doesn’t want to listen to riparian experts; he is firmly in the man-made nature camp, where controlling nature through engineering is king. How can he claim that Buffalo Bayou is not a natural river? Saying it does not make it so. Of course, this is also the genius that said (paraphrasing) “people enjoy floods, so they can get new houses” in the wake of tremendous destruction and suffering this past summer from spring floods. I was really hoping Radack did not get reelected earlier this month. I have never seen a politician waste so much taxpayer money putting his own name on signs for parks, running trails along bayous, etc where it has no business being. Signs that will all have to get replaced once he leaves office at our expense once another commissioner is in office. I have had the displeasure of having to speak with him in the past at his office for work and you are not even allowed to talk to him until bdeing asked to “donate” to his campaign. He would turn all of Addicks and Barker Reservoir into parks named after himself if allowed to with no consideration of drainage or flood prevention. Earlier this year Radack told a roomful of flood victims that “some people enjoy flooding. They get their house remodeled and a new car.” He obviously has no empathy for those whose lives have been ruined – multiple times – and who live in fear that it will happen again every time it rains. Clearly, he doesn’t understand how trees/plants work to help lessen flooding. He should get a lesson from experts Sam Brody and Larry Dunbar. The non-profit group Residents Against Floodng has worked for over 9 years trying to get City and County governments to be proactive in preventing man-made flooding. We have been forced to file a federal lawsuit against the City to get them to protect citizens from avoidable flooding catastrophes. It is heart wrenching to see politicians forge ahead, doing things “their way,” to the detriment of others just because they can. didn’t they? Hence the name “Ascension on the Bayou,” built on fill. Get it? Hard to believe that Radack would need to truck dirt into the reservoirs since there is too much sediment there already that drops out of the impounded stormwater and needs to be cleaned out. I spend almost all of my free time within Barker Reservoir (my backyard opens to it) and can say that the amount of silt that was deposited there from the April 2016 rains is incredible. There are areas along Mason Creek and Buffalo Bayou in the wilder portions of the reservoir where it is like walking on a beach now due to the sand and silt. Undoubtedly this is something that needs to be addressed because it has decreased the holding capacity of the reservoirs. I have given before and after pictures of areas to the Corp of Engineers but whether anything is done about it…. I’m pretty sure the forces that be will eventually bulldoze our forests and trails in Terry Hershey Park no matter what. It’s a theme in the Houston area to cut down any naturally occurring forest and build something else. The developers and government of this region have no respect for natural beauty, whatsoever.